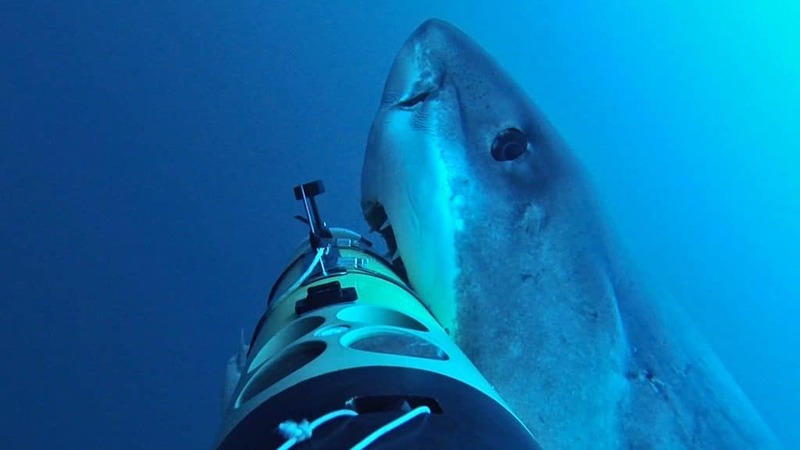 The dramatic video footage of a great white shark attacking the “REMUS SharkCam” autonomous underwater vehicle (AUV) brought some of the highest ratings to Discovery Channel’s Shark Week 2014 and went viral on the Internet. But while the footage was unprecedented, the scientific understanding enabled by the REMUS SharkCam is just as groundbreaking. 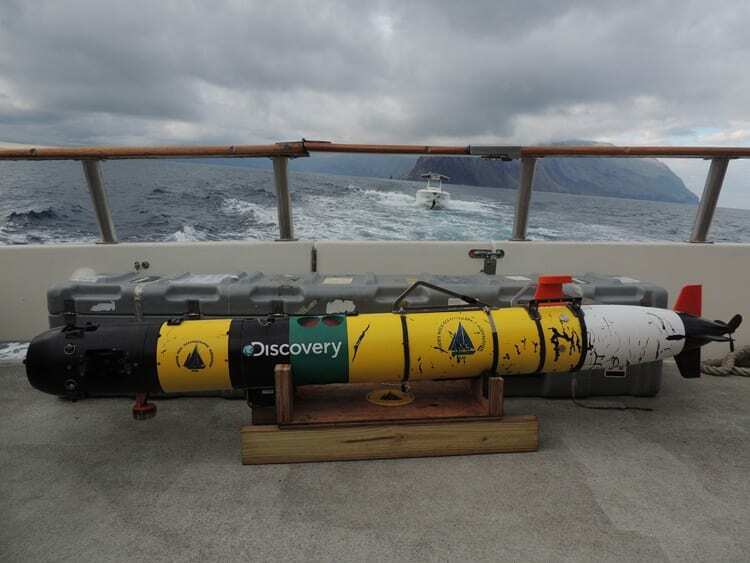 The AUV was used during a science expedition in 2013 to better understand white shark behavior and represents the first successful efforts to autonomously track and image any animal in the marine environment. The research provides critical data to efforts to conserve these animals. 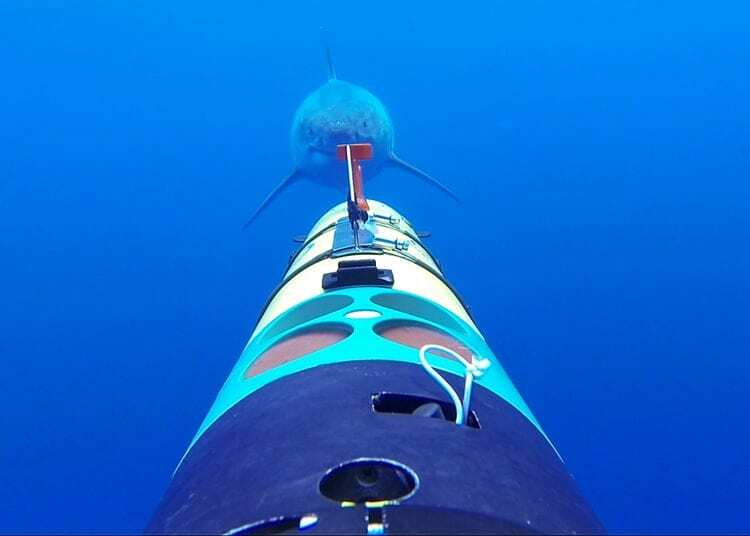 “We wanted to test the REMUS SharkCam technology to prove that is was a viable tool for observing marine animals—sharks in this case—and to collect substantial data about the animals’s behavior and habitat,” said WHOI engineer Amy Kukulya, one of REMUS SharkCam’s principal investigators. The research results were recently published in the Journal of Fish Biology. The paper’s lead author is Greg Skomal, a biologist with the Massachusetts Division of Marine Fisheries. In addition to Kukulya, co-authors include biologist E. M. Hoyos-Padilla of Pelagios-Kakunjá, a Mexican marine conservation organization, and WHOI engineer and REMUS SharkCam software developer Roger Stokey. Working in the clear waters off Mexico’s Guadalupe Island, Kukulya and her colleagues conducted six AUV missions over seven days in November 2013. During that time the team tagged and tracked four sharks over six days using REMUS SharkCam, collecting over 13 hours of video data from the AUV. The team tracked one male and three female great white sharks, including the famous 21-foot Deep Blue, down to depths of 100 meters. While the team was able to tag four sharks, most of the encounters REMUS SharkCam documented were with animals that were not being tracked. The researchers logged 30 interactions with ten individual sharks. The behavior of these sharks filmed by REMUS SharkCam ranged from simple approaches to bumping the vehicle and, on nine occasions, aggressive bites. The bumps were thought to constitute aggressive behavior consisting of brief physical contact, usually with the shark nudging the vehicle with its snout. The bites were interpreted as predatory behavior by the animal, which usually happened toward the rear of the vehicle. “Predation events are rarely witnessed,” the studies authors wrote. “Virtually all of the published observations of predatory behavior are based on surface interactions.” Yet, off Guadalupe, there was very little predatory behavior happening at the surface or in plain sight. The researchers suggest that Guadalupe’s clear waters offer sharks different opportunities to hunt, but they lacked the ability to study the shark’s behavior at depth. The observations made by the team constitute the first observations of predatory behavior well below the surface. The findings suggest the sharks take advantage of the clear visibility in the waters off Guadalupe to search for seals and to ambush and disable them by attacking from below, where the shark is concealed in darker water while stalking the seal, which is silhouetted from above. The REMUS AUV was originally developed for coastal mapping and monitoring, but successive versions of the vehicle have been customized for a wide range of work. 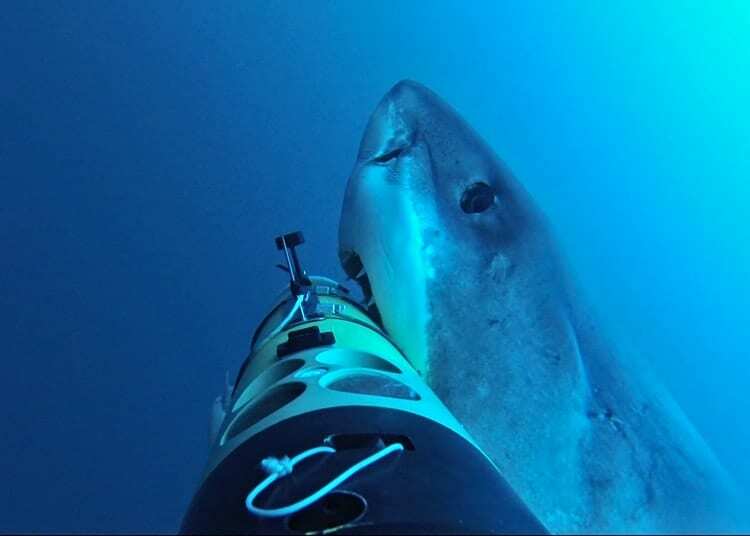 The REMUS SharkCam is outfitted with water current profilers, salinity and temperature probes, six HD video cameras as well as other sensors, to give scientists a broad range of data on the animal’s position in the water and its habitat and behavior from multiple angles and perspectives. During operation, Skomal uses a harpoon to tag the shark’s dorsal fin with a transponder, while Kukulya and her colleague Roger Stokey quickly launches the REMUS SharkCam. The tag’s transponder communicates with the AUV, allowing it to track the animal up to depths of roughly 100 meters. When the mission is complete, the team sends an acoustic command to the shark tag’s release trigger, which then mechanically releases the tag from the animal, allowing it to float to the surface for retrieval. Last month, the team returned to Guadalupe to continue their research tagging, filming and studying great white sharks. The new video will be released in summer 2016 during Discovery Channel’s Shark Week. In the future, the team wants to use a deeper diving REMUS that can also swim for longer durations. Future work will center on increasing tracking durations by using better batteries and integrating the camera systems into the AUV electronics. The REMUS SharkCam on the ship’s deck with bite marks clearly visible.